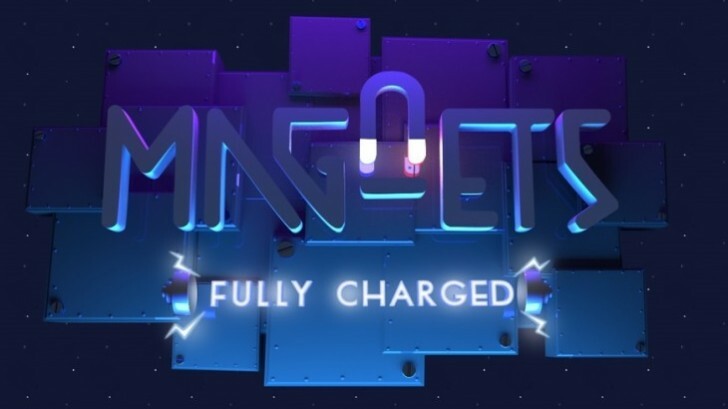 MagNets: Fully Charged is a fast and furious “collect-em-up” as described by developer Total Monkey. Your home of Polarity City is under attack by Bloxbots, the formerly helpful maintenance cubes and it’s up to you to secure areas and take down the evil force responsible. As the main character, Faraday, you use your magnetic field powers to defeat the Bloxbots. Once defeated they turn into scrap which you must collect and place in the recycletron. The scrap is turned into items that you must place in specific areas to move on and complete the level. The player must defeat enemies, collect and recycle scrap while also protecting landmarks to clear a level. At the end of a level you are given a score based on how well you did. If the Bloxbots damage the landmarks enough times they will be destroyed and you will lose points and sometimes be forced to restart. If attacked you will drop all scrap you’re holding and if you don’t pick it up it will disappear, ala Sonic the Hedgehog coins. Do you collect lots of scrap and deposit it at once or little by little to assure it isn’t lost? There’s a nice balance here of risk versus reward. Faraday has some special moves to help him reclaim each area. For a limited time the player can dash, which makes avoiding enemies and recycling scrap easier. Pressing A to jump and then Y will perform a ground pound move that temporarily stuns enemies. It won’t take long to memorize these controls thanks to a quick tutorial at the beginning of the game. Controlling Faraday and dashing through the world is a joy, but I have a major problem with the ground pound move. The problem is that it just doesn’t work when you need it to. There were countless times when scrap was surrounded by Bloxbots and I was hoping to ground pound everyone and grab the scrap unharmed. Unfortunately the ground pound move works about half the time and I would just end up jumping into a death-circle of Bloxbots. This is a game where precision is key and even one unnecessary hit can mean the difference between finishing and failing a level. Needless to say this was a major cause of frustration during boss fights and later levels as the difficulty got quite high. Despite some control difficulties, I kept playing whenever I failed because the game is challenging in a fun way. Every time I lost and restarted I felt like I could do better. I could manage my boosts more efficiently, jump more to avoid attacks, or maybe try tackling objectives in a different order. What makes the game challenging is the number of enemies and the lack of many health pickups. In later levels tougher enemies have seeking missiles or laser beams. Health seems to spawn randomly along with an item from the recycletron. While I welcome more health during the mission, the randomness of the drops caused some headaches during later boss fights. During the final level I received health twice in a row on my first playthrough; for the next hour I spent fighting the boss I was lucky to even get one health drop per attempt. I found this to be very annoying because I didn’t run out of time or fall off the map, I always died because of health loss. That being said if you keep trying and maybe earn a different character to play as, you shouldn’t have too much trouble finishing the campaign. MagNets has 20 levels that span across 4 zones and can be played solo or in local multiplayer. You can also replay each level in challenge mode and complete objectives to unlock more characters. Objectives are similar in each level and range from: beat the level in X amount of seconds, collect X amount of scrap, no health lost and no objects lost. The new characters you unlock have different stats of health, speed, and magnet strength. I’m not a big fan of unlocking characters through challenge mode, I would rather more be unlocked through completing the story. Even better I would have preferred just one character that could be upgraded through a point system. Thankfully this never becomes that big of an issue as most of the levels are easily beaten with the default character. Graphically the game is colorful and vibrant, albeit not super detailed. The game is played in a top-down view which lets you see a lot of the map. Although whenever I started a new level I always had trouble finding the recycletron, I usually ended up taking damage looking for it and just restarting. The environments range from outdoor green areas to more indoor futuristic facility areas. With only 5 levels per zone and 4 zones total, you are never in one area for so long that you tire of the setting. The sound is also an enjoyable aspect of the game. Catchy techno tunes keep you going strong in each level and it fits very nicely. MagNets: Fully Charged is a fun action game that will keep you coming back despite its shortcomings. Most levels can be completed quickly which keeps the story moving. When you hit a roadblock, simply rethinking your strategy and being persistent should lead you to success in time. At $14.99 the price may seem too steep for those who value content-rich games. The campaign can be finished in a couple hours and if challenge mode and multiplayer aren’t appealing you may find yourself moving on to something else quickly. You can catch me all over the ID@XBOX community on Twitter, Twitch and Mixer with the handle Jordan650.